It tells how one woman learned to dig deep and push the boundaries in order to discover what really matters in life. Miriam is a young Dutch woman living in the heart of the mountains with her New Zealand husband. She lives simply in a tent or hut, and survives by hunting wild animals and foraging edible plants, relying on only minimal supplies. For the last six years she has lived this way, through all seasons, often cold, hungry and isolated in the bush. She loves her life and feels free, connected to the land, and happy. There's a lot of drama out there in the wild, and Miriam knows how to spin a good yarn. 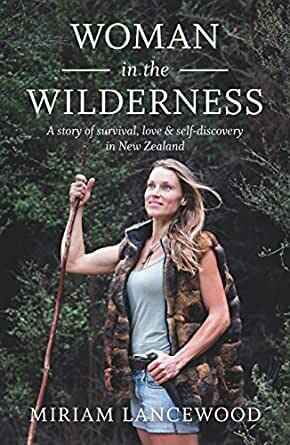 This is a gripping and engaging read reminiscent of both adventure writing like Wild and nature writing like H is for Hawk, and is perfect for anyone exploring the idea of living a more authentic, real life. An inspirational story of adventure and bravery, of how one woman learned to dig deep and push the boundaries in order to discover what really matters in life. Loved it! While I don’t think I could do what Miriam and Peter did, it was great to live their life vicariously through the book. They have a rare approach to life and their story abounds with lessons for everyone: tread gently on the earth , be receptive to our environment and each other, live honestly and bravely. I kept expecting something tragic or awful to happen, because so many stories these days are about tragedy and overcoming hardship, so it was refreshing to read a story where the characters encountered only good. Their attitudes and respect for life, others and the environment is so refreshing. Loved it. So beautifully written. Brought back so many memories of tramping as a child through the bush in New Zealand and staying in the huts. Bathing in the ice cold water straight off the glacier and skin burning red afterwards and the exquisite beauty of Southern Alps all captured by the author. A great read. Wish the author and her partner all the best in their next adventures. I am enjoying it in the sense of reading about a simpler life, and the process of Miruam coming to terms with hunting and consuming meat. However, I can't help but feel a bit "off" about the power dynamic between Peter and Miriam, his condescension does not well with me. Lovely simple and natural writing style, with enough wisdom and contemplation interspersed to provoke thinking about some important issues. Remarkable story of courage and love. Despite it being a linear narrative, there's a nice balance between the remarkable and the "routine" aspects of living. Overall I would highly recommend this book. This book is written so well that as New Zealander I could see in my minds eye the whole happenings. A great read. I absolutely enjoyed every moment of the journey as related by Miriam. If you have ever thought of leaving civilization to start a life away from cities and schedule this book is the inspiration. Great book, love the vivid descriptions of the NZ landscape, an honest and authentic account of nomad life. Really inspiring!